Regular shoppers and people who follow Seibiant will know that we care passionately about our teas and coffees, and a big part of what what matters to us, is that we need to be as confident as possible that the people we buy from are taking care of the environment, the workers and us, you and me. Nestled in the north-east of India, bordering Bhutan and Bangladesh, the state of Assam is almost synonymous with tea. Around the time of India’s independence in 1947, Assam was one of the richest states in India, but today it is one of the poorest. Assam’s rise and fall can be explained in part by the development of the tea industry, first by the British colonial power and later by the owners of the tea estates and the big brands they sell to. Today, around 52% of the world’s tea is grown in Assam. Nearly 1 million workers and their families are directly dependent on the tea industry for their livelihoods. Most of the workers who pick tea are women. Last week, we attended a talk which was organised by Traidcraft Exchange, about the conditions that tea pickers in Assam are having to endure, and what we as tea drinkers and tea suppliers can do to help make sure that they are getting a fair deal. The focus isn’t on Assam by accident, there are good reasons for the focus to be on this region currently. Poverty: Assam is one of the poorest states in India, and tea workers in Assam are amongst the lowest paid in India. An Assam tea worker is paid R137 – (£1.51 a day), minimum wage for an unskilled agricultural worker in India is R300 (£3.30) . Additional ‘in-kind’ benefits include services such as housing, sanitation, health facilities, and primary schools, and subsidised food rations, but Traidcraft’s research suggests that these are either not delivered at all, or are delivered poorly. Women have to use their cash wages to pay for services which should be provided by the estate, so have to make choices between educating their children, eating properly, accessing health care, repairing their homes. Many find themselves in debt. History: Most of the people working on the tea estates are descendants of tribal communities such as Adivasi who were brought into Assam by the British in the late 19th and early 20th century. They live in designated settlements called ‘labour lines’. The Plantations Labour Act 1951 gave tea estates a special status under Indian law, whereby the owners of the tea estates were required to provide services to their workforce which would elsewhere be provided by the government. Times have changed however, and the government is reviewing this Act, but in the meantime the workers are still reliant on the estate for their most vital services. Tea estate managers control worker status – whether someone is designated a permanent worker or not, or will get temporary work when available, work environment and working procedures, housing, water and sanitation, creche and primary schooling facilities, health facilities on the estate, access by independent organisations, and access to credit. For us at Seibiant, there is a big question that must be asked here … Is this actually modern slavery? What can we do? What is our responsibility? 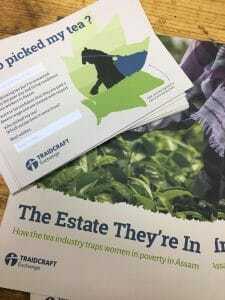 It is not our role at Seibiant to criticise other tea companies, but we can tell you that Traidcraft have a campaign called “Who Picked My Tea” which is directed at the Big 6 UK tea brands, PG Tips, Twinings, Tetley, Yorkshire, Typhoo and Clipper, which together comprise 70% of the UK tea market. They all use tea grown in Assam. Unilever, Tata and Twinings are significant global players, estimated to account for 20% of the world tea market, so they clearly have a huge, significant influence. Traidcraft want the Big 6 to publicise which tea plantations they source their tea from, so that drinkers can be confident that the pickers are being paid a decent wage and are treated with respect. What we have done so far at Seibiant is to write to our own suppliers, where we are not buying direct, and asking them how close they are to direct trade, and if they are able to influence their suppliers. We are also attempting to source direct trade tea in Assam from the smaller tea gardens and co-operatives, which are paying their workers properly, as well as often growing their tea using more sustainable methods. By buying direct, we are demonstrating to the bigger tea plantations that it is possible to work in a different way to their traditional ways.